Clarinetquest is proud to offer FREE SHIPPING on nearly all of our products for orders of $99 and above. As musicians and strong supports of live music, we're delighted to be able to pass along this savings to you! 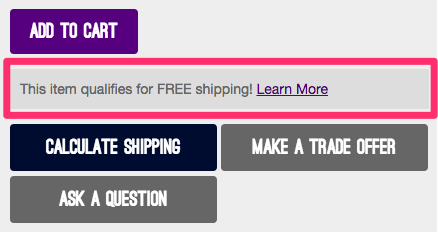 Any product that displays the "FREE SHIPPING" bar near the product price may qualify for this offer. Free shipping on all modern, vintage and/or used instruments. Nearly all accessories qualify for meeting the free shipping terms. Available only for shipments to states within the United States (48 contiguous states). Excludes large oversize package items, international shipments and shipments to FPO/APO addresses. Normal shipping charges will be applicable for all other non-qualified items and orders. Free shipping is valid with purchase only and not offered on product exchanges. In the case of a return, the shipping charge will be deducted from the amount refunded if the return drops the overall order to less than $99. We reserve the right to cancel or change this policy at any time. Every product that qualifies for Free Shipping will be marked directly below the product price.